Glass Table and Desk Top Replacement from Valley Glass in Kent Washington. Glass is an important component of almost every style of modern architecture. With more Kent, WA homeowners opting for a minimalist approach to the design of their homes, glass table tops have become an even more popular constituent of home design. 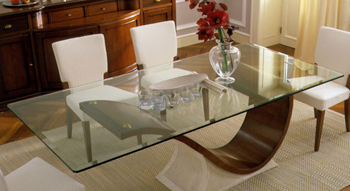 Glass table tops create a definitive style, adding elegance to the design scheme of the home. Valley Glass can custom cut your table top glass to fit any size. Whether you are in need of a table top replacement or you want to protect your wood furniture with a glass top, we will provide superior glass products designed to fit your need. Don't let broken or chipped glass be a safety risk to your family--It can lead to serious injuries. Valley Glass can install glass including mirror glass, table top glass, shower door glass, and glass for doors that will fit your needs, budget, and style. At Valley Glass, we know that glass is used in a large number of applications in the household such as tabletops, shelves, windows, doors, display cases, shelves, partitions, mirrors and many more, so it is easy to see how much of an impact it has on the design aesthetics of a home. Mirrored glass is an excellent design element that will open up the room and make it appear brighter and larger. The ideas and options are endless when it comes to mirrors. Valley Glass can install custom-cut mirrors for any room in your house. Whether you are looking to update your existing bathroom vanity mirror, fit a mirror above your fireplace, or create a mirror wall for your basement, Valley Glass can help. Our team of expert designers will help you create the look you want to achieve. Mirror glass is used for more than practical purposes; it has become a style statement. Replacement services at Valley Glass make sure that your home gets to look as good as you want by customizing our service to match your requirements exactly. We take great pride in our workmanship and deliver our best effort to our Kent clients, offering them new options to raise the aesthetic value of their home significantly. Valley Glass has the knowledge and ability to custom cut glass for shelving and a variety of other uses around the house. Custom-cut glass adds a level of uniqueness and personal touch to glass table tops, desktops, furniture tops, or glass shelves. 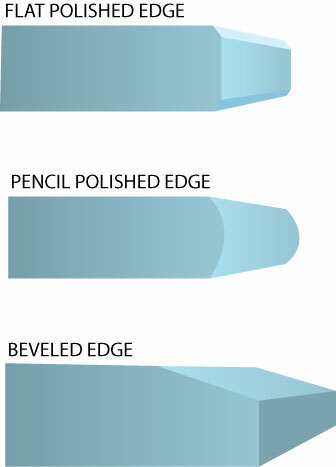 Valley Glass also offers special order glass with various custom glass edging options tailored to personal taste. Contact Valley Glass today for a free estimate at (253) 852.4460 Rely on us for quality, experience and all your glass needs!